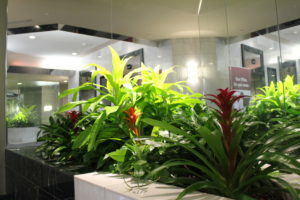 Our clients typically order tropical plants for their office for the aesthetic appeal. They quickly learn that tropical plants offer much more than just good looks. I want to take this opportunity to refresh in our minds the many benefits to be gained by adding some greenery to your office. Workers demonstrate improved creativity in office environments that include green plants and flowers. Employers report significantly less absenteeism due to Sick Building Syndrome when plants are added to the office environment. Plants naturally clean the air and increase humidity. Tenant occupancy and retention is greater in buildings that include tropical plants. Plants dampen sound levels, reducing office noise distraction. 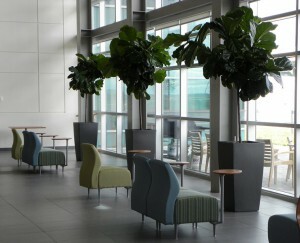 Well-kept plants increase your company’s status by creating a successful image. Plants can be used as natural space dividers, or offer a creative way to direct the flow of traffic in an office. Plants provide accent, texture, colour & shape, contrast, scale & proportion – all of which contribute to harmony of design. Most importantly, people love plants! Adding plants is by far the most cost effective way to boost the ‘feel good factor’ in your office. Want to learn more about these benefits? Contact us and we can provide you with more information and material to support the facts above.